Last year, I wrote this article about finding the illustrator behind the Loreto Embroideries in the Royal School of Needlework’s collections. Today, for enthusiasts of historical embroidery and art in general, I’d like to share with you, with permission from the author, a short article by John Shaffer, retired Director of Arts Programming at the State University of New York, Oswego. John is also a fan of Anichini’s illustrations. We’ve corresponded back and forth for a little while about Anichini, so I was thrilled to read his insightful article. I think you will enjoy it, too, especially if you’ve experienced the Loreto embroideries at the RSN. Ever since I first clapped eyes on the Loreto Embroideries held by the Royal School of Needlework (and, unfortunately, I mean clapped eyes on images of them – I’ve not seen them in person), they have fascinated me. While their provenance is not entirely clear, it is perfectly evident that the panels held by the RSN are accurate adaptations, worked in needle and thread, of Anichini’s original illustrations. As I mentioned in last year’s article, there’s really no question about his being the original illustrator. The questions remain as to whether or not the adaptations were commissioned, whether they were just the whim of a skilled embroiderer or group of embroiderers, whether the embroiderer(s) intended to adapt all of the original 46 illustrations into embroidery – these are things we will probably never know. Since coming across Anichini’s illustrations, I’ve dabbled in exploring him further. I find his style quite captivating and distinctive, no matter the subject. If you’re a fan of early 20th century art, you may enjoy exploring him, too. So many of Anichini’s illustrations could translate into fantastic embroidery. I “toy” with his images frequently, imaging how I would interpret them – or excerpts from them – into embroidery. And while I haven’t taken the plunge yet, some day, I hope to! John Shaffer’s article, Ezio Anichini, Creative Knight Errant of the Ideal (PDF), will give you some insights into what influenced the original artist behind the Loreto embroideries. And thanks so much to John Shaffer for allowing me to share it with you! Ezio Anichini was a wonderful artist and draftsman. 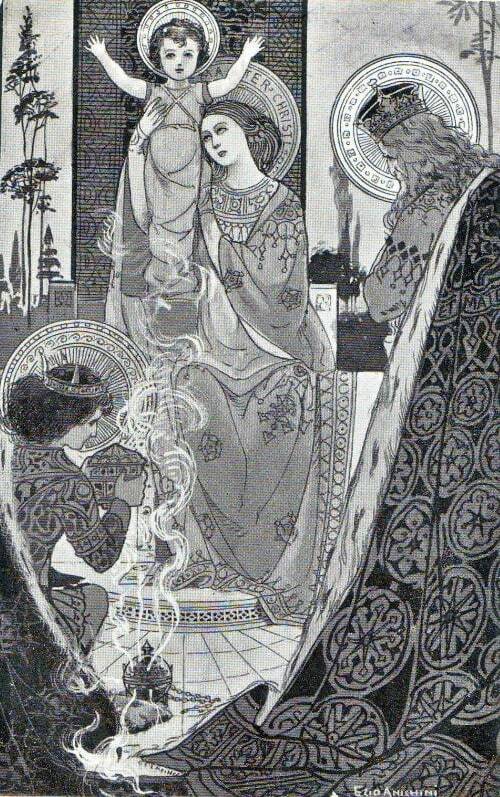 His use of the Art Nouveau style was a perfect choice for his illustrations of The Litany of Loreto. Thank you Mary for diving down the rabbit hole of curiosity. I’ve searched but can’t find his work for sale. Perhaps all those postcards are being kept by the families of the original owners. Luckily I bought some Christmas cards and postcards from The London School of Needlework many years ago. I still have most of them as I can’t bear to part with them. Thanks for the link – a very interesting read. It ties in well with your post about that ugly embroidery: I wonder how many items of beauty have been destroyed because they are considered sacred but past their use-by? These beautiful embroideries are a case in point. While I agree that items sacred to people’s beliefs should by treated with respect, our galleries and museums and our culture would be seriously impoverished if nothing could pass from clerical to secular ownership. Thank you for sharing this information. I recall seeing a couple of these illustrations in an art magazine as a child. Sadly that magazine is not at home anymore. But the influence they had on me is seen in the way I collect art illustration reproductions. I enjoyed reading this. Have a beautiful month. I just ran across your website and love it. I’m wondering if you might help me identify a textile that was purchased in Venice about 15 years ago. I can send you a photo. It is red velvet, antique wand heavily embroidered with gold thread. Please let me know if I should send a photo. Hi, Lynn – You can send photos to mary(at)needlenthread(dot)com – I’d love to see it. The descriptions sounds intriguing.